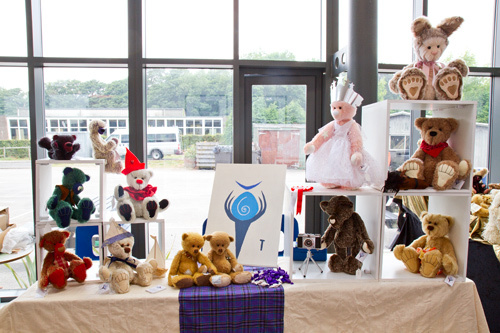 I spent yesterday at the Lakeland Doll and Bear Fair (with the help of mum and dad). Steady flow of customers all day, although no Littlest Thistles wandered off there and then, I’m hoping there may be some follow up adoptions. It was a great venue – what must be the cafeteria at The Lakes School, and there was plenty of light, although it was a little sticky – I think the UK is just not geared up for air con! I came home with some new materials to try, viscose from Sew What And Stuff It, which is supposed to be great for distressing, and something to anchor my new panda’s nose, and do her paw pads from Susan at Bear Basics who deserves a reward for driving all the way from Somerset to Troutbeck on her own and hauling a bear maker’s dream of supplies all by herself! I've never been to a doll and bear fair, it looks like fun. I used to love craft fairs but haven't been to one in years. It looks like I've got to get out more. Have a great week. Your bears are very nice. I like your table very much. At the moment the adoption seems to be difficult. If we hope for better times. Maddy, yes, you must go to one, they're fab!